Millions of people are infected with dengue fever every year. Dengue fever is transmitted by mosquitoes. Dengue fever (spoken as “dengee”) is a painful tropical disease that is caused by the dengue virus and spread by mosquitoes. There are a total of four dengue viruses that are closely related. Each of the four is capable of causing the fever. The viruses have relations with those that cause yellow fever and the West Nile infection. Statistics show that there are 390 million infections worldwide per year. Out of these, about 96 million infections lead to illness. The most affected regions of the world include Taiwan, Mexico, Africa, The Pacific Islands, The Indian subcontinent, Southeast Asia, South and Central America with the exclusion of Argentina, Paraguay, and Chile, Southern China, and other tropical regions. The dengue virus is transmitted by mosquitoes that are infected with the virus. Aedes mosquitoes, especially the Aedes aegypti species since its reproduction happens close to human populations, are the ones responsible for the largest percentage of infections. Primarily, this species of mosquitoes live in the tropical regions between latitudes 35◦ north and south of the equator. Further, the mosquitoes prefer habiting areas that have altitudes of less than 3,300 feet. While the mosquitoes typically bite in the mornings and evenings, they can also bite during other times of the day. 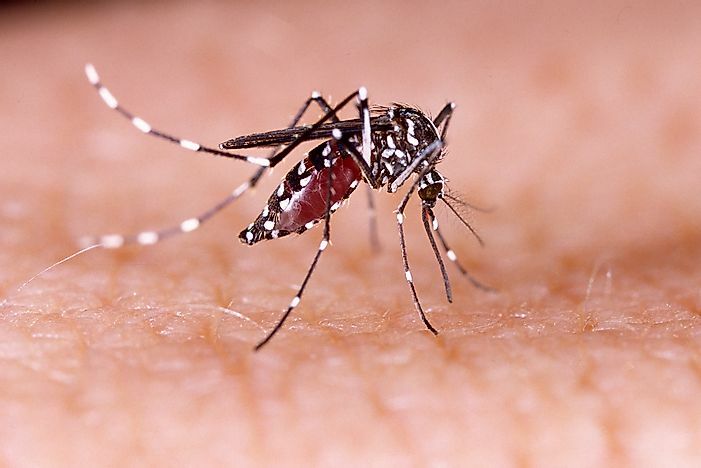 Others species of the Aedes that are responsible for the spread of dengue fever include Aedes albopictus, Aedes polynesiensis, and Aedes scutellaris. The virus may also be transmitted through infected blood products or infected organs that have been donated. A few cases where pregnant mothers have transmitted the disease have been reported. Upon infection, an individual will begin to experience the symptoms of the fever between four and six days after being infected. The symptoms may be present for up to ten days. One thing to note is that most individuals (around 80%) that have been infected will have mild symptoms while around 5% will exhibit more severe symptoms. The symptoms may include high fever that is awful headaches, joint and muscle pain, nausea, fatigue, vomiting, mild bleeding such as from the nose, a skin rash, and pain beneath the eyes among others. Interestingly, the young and those who have never been infected usually experience mild symptoms compared to older people. At times, the symptoms may become life-threatening. In some cases, high fever could be a symptom of dengue hemorrhagic fever. This high fever is characterized by bleeding of the nose and gums, circulatory system failure, and liver enlargement. Fortunately, dengue fever rarely develops that far. However, people with low immunities and subsequent dengue fever infections need to be careful. Doctors are able to analyze blood samples in a lab to determine whether the virus is present or not. Currently, there is no specific medication for the fever. Typically, the doctors will administer painkillers and monitor the patient. Taking all measures to get rid of mosquitoes and prevent mosquito bites. Avoidance of heavily populated residential areas. Seeking a doctor immediately if someone suspects an infection. Where Is The Yellow Fever Belt Of Africa And South America? What Does Old World and New World Refer To?